I spend much of my time helping those around me feel important and successful, maybe it’s because I was like them. People thought I lacked potential, I didn’t have the drive for success, or would end up a statistic due to lack of education. Not everyone can work in the same box and as a creative person it took me a long time to figure that out. Once I found what drove my personal passions I was able to channel it for success. I now spend my time through my businesses and various programs helping people realize their potential by inspiring them to follow their dreams and my goal now is to inspire the future by helping others! If you’re looking for some basic information on business or leadership then my books may be the best place to start. If you need more in depth help to get a business started in the arts or transportation then the consulting page is the best place to go. If you need inspiration to help take you to the next level then the podcasts are a good place to get that motivation. Many young people have big dreams but need inspiration through seeing others that have gone before them and if that’s you then check out my show Inspiring Youth. You can learn more about me on the about page and the blog page is a good place to get more free information. Now get started inspiring your future. I have three talents in my life that I focus on which include drawing, writing, and speaking. I have used all of these talents to build my business for over a decade and I am offering those talents to help you. If you are looking for free resources check out my podcast for creatives, my television show Inspiring Youth, or my blog posts on creativity, business, and leadership, and gain the inspiration you need for the future. Learn how to build a value based business using your internal values and beliefs. Bruce uses his comic book series as the base for this presentation helping creative entrepreneurs follow their values to create unique businesses. you spark inspiration from within through the eyes of other very successful creative entrepreneurs. your audience with creative content. 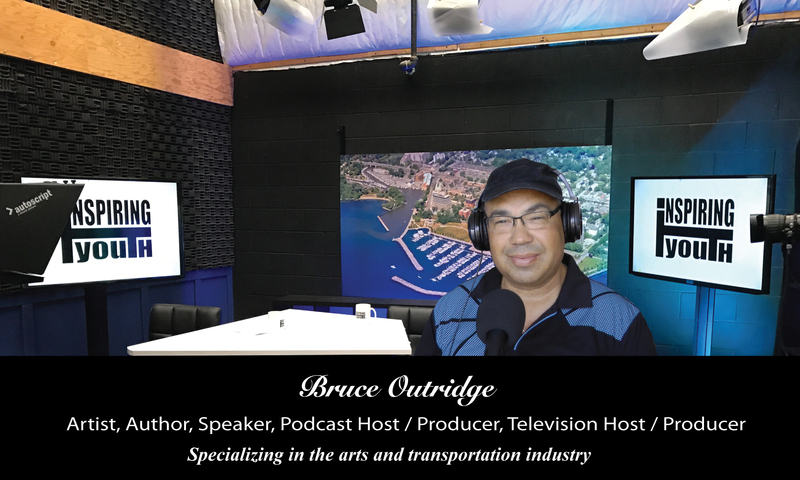 Bruce talks about how he became a creative entrepreneur after a life of driving trucks and how his experiences helped him create the successful business he has today. You will get a speaker that is entertaining and fun! You will get a speaker that has built his career on what he talks about! You will get a unique presentation that has fun-filled aspects from the world of art! From here it is best to view each presentation of interest, but if you still need more information please feel free to reach out to us. call us 289-337-2630 or email us by clicking here! The Bruce Outridge book store includes topics on business and leadership. These include his latest 3 Steps to Creating Memorable & Effective Content Workbook, Running By The Mile, Driven to Drive, and How to Start an Artistic Business in 12 Easy Steps. Some books have been turned into courses that are now taught in career colleges and I am often hired to help companies with their marketing and social media programs. I bring the business experience of an entrepreneur, the creativity of an artist, and the leadership of a top professional in my industry. If you are looking to read information that can help you be better in your career or business then this is the place for you? This book is for artists and creative looking to start their own businesses and not sure where to go next. The book is part workbook and guide and is laid out so people can work at their own pace. This book is a workbook that paired with Bruce’s workshop or video course helps business owners, marketers, or those looking to create content a formula for finding their target market and reaching them through social media or presentations. to help drivers have long successful careers in the industry. You can learn more by clicking the link here. This book is for those wanting to become owner operators in today’s trucking industry. This book was turned into a course as well and is available to be taught live or through Bruce’s video course. Most titles are available in paperback or ebook versions.